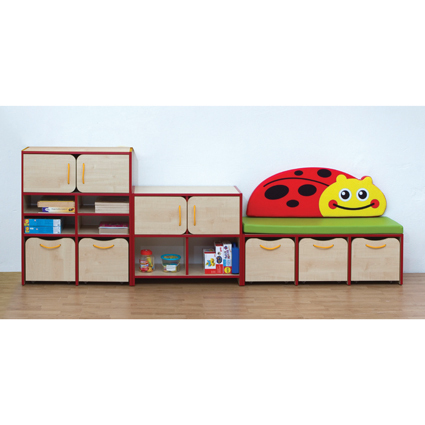 Ladybirds, Hippos and Frogs add to the fun of this Nature themed storage range. Open shelves, cupboards and pull out storage boxes (on castors) are combined in this range with fun foam filled seats and backrests (includes Velcro fastening). Manufactured from 18mm maple melamine faced particle board with strong yellow rope handles and a choice of coloured edge banding.